THEY WERE the shows that delighted a generation of children. Now, priceless, long-lost episodes of Ivor the Engine and other animations by the late Oliver Postgate are once again set to entertain – after being found in a pig shed. 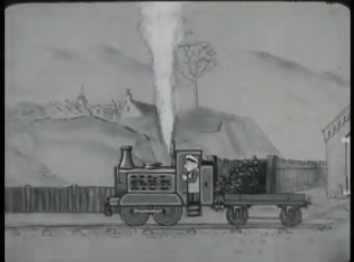 Described as a “treasure trove” from the “golden era” of children’s TV, the find includes 26 episodes of Ivor, featuring the adventures of the little green locomotive from the “top left-hand corner of Wales”. The 10-minute black and white animations – described as the “real Ivors” by experts – were discovered among a pile of 40 rusty film reels in the disused pig shed of artist and animator Peter Firmin. Firmin, 82, had kept them and other sixties’ show created by Postgate on his farm in Blean, Kent, where they had gathered dust for over 40 years. Former business partner Postgate, who died in 2008, aged 83, had handed him the the unique 16mm recordings in the assumption that the crude stop motion animations had “had their day”. TV historians, however, have hailed the haul as an “important” recovery which will “shed new light” on the early output of revered production company Smallfilms. Founded by Postgate and Firmin in 1958, Smallfilms went on to make some of the most-cherished British children’s programmes ever to grace the small screen including Clangers, Noggin the Nog and Bagpuss, once voted the nation’s favourite children’s show in a BBC poll. Along with the newly-found episodes of Ivor the Engine, dating from between 1962 and 1964, a number of Postgate’s lesser-known programmes such as 1960’s The Seal of Neptune and The Mermaid’s Pearls, from 1962, have also come to light. The missing shows were identified by members of Midlands-based TV research organisation Kaleidoscope, who had been called in by Postgate’s son Daniel after he decided to have a clear out of his late father’s archives. There are now plans to have the shows digitally restored and re-released. Speaking from his home in, Daniel Postgate said: “Dad never discussed the whereabouts of his early films with me so it was a complete surprise, and joy, to find them. “These are major finds – genuinely missing episodes from a much-loved children’s TV show. “They haven’t been seen in over 40 years and will tell us a lot about Dad’s early work and how he developed Ivor as a series. That was difficult before because so little was thought to exist. Chris Perry of Kaleidoscope said: “This is an exciting discovery of early work by one of Britain’s most fondly-remembered animators. “Creations such as Ivor the Engine, Clangers and Bagpuss have gone down as classic children’s shows from a golden era of television. The Postgate find is one of many included on Kaleidoscope’s annual Raiders of the Lost Archive list, revealed last Saturday, October 23, at BAFTA in London. Other major recoveries made by Kaleidoscope, the British Film Institute, BBC and individual TV historians this year include episodes of The Benny Hill Show, The Rolf Harris Show, and Monty Python precursor At Last the 1948 Show, as well as more than 60 star-studded BBC and ITV dramas found in the Library of Congress, in Washington DC, America, back in August. Wiped Exclusive: Interview with Daniel Postgate. The story of the Ivor the Engine Finds has also been covered on the BBC (1960s’ Ivor the Engine episodes unearthed in Kent), Wales Online, and in the Daily Mail.